The existing toilet/shower/changing and parking facilities at Oxfield are completely inadequate and do not meet the needs of user or the wider community. This draw aims to raise €40,000 matching funding which will allow the Oxfield Committee to apply for Grant Aid funding of up to €200,000 on behalf of our clubs, groups, and associations. This is a once in a generation initiative which if successful will greatly benefit our community. While acknowledging the difficult times we are in, we ask is that you consider our proposal, the relative costs involved, and the benefits which an improved Oxfield Centre offers to you, your family and your community. Thank You! THANK YOU... THANK YOU... THANK YOU!!! 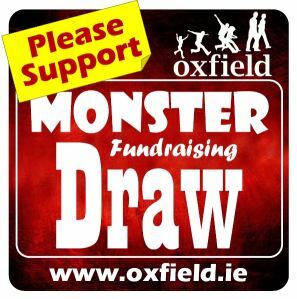 The Oxfield MONSTER Draw raised over €40,000 to support the next development project at Oxfield. This is a wonderful achievement for the Oxfield Committee and all the Clubs, Groups and Associations who joined forces to make the fundraiser a success. But more importantly it is a brilliant example of community spirit and goes to show what can be achieved when everyone pulls together to achieve a much needed goal. So congratulations to the lucky winners, and a huge thank you to all those who supported and sponsored the fundraiser, and especially to all those behind the scenes who made the magic happen! - Cheques - should be made payable to Oxfield Sport Centre Ltd.
- We are indebted to the generosity of our pool of Prizes Sponsors. Without their support, this draw could not happen. 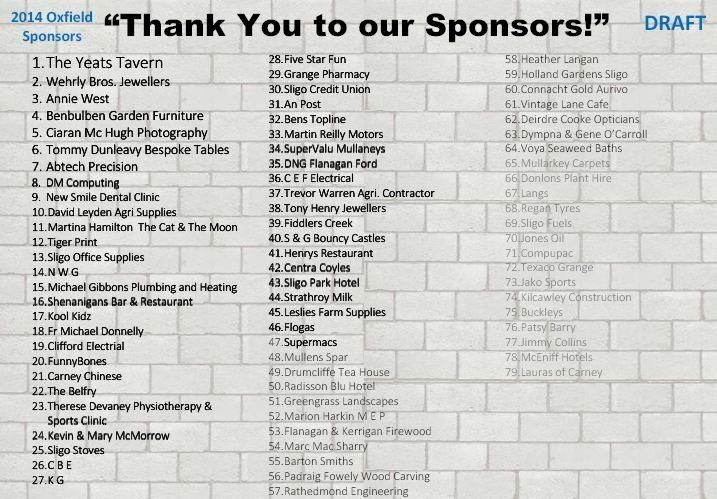 Please take a moment to view our Sponsors THANK YOU Wall below.